Well, you have just finished your renovations, or maybe you have just moved into a new home. Often the biggest thing we consider is the furniture, are you going to keep the things that you moved in with or is a whole new look on the cards? New spaces often will dictate if existing furniture and décor items will work, it may be that the shape of the space or the configuration of your furniture will not fit and you will have to start with a fresh approach. Once you have worked out what you want to achieve and either decide to work with what you have or start again, there are a few elements to consider. When buying new items for you home, you will need to visualise what they are going to look like in the intended location. Some people find this an easy thing to do and others do not. When estimating the size or scale of furniture, making a mud map with paper can help to realise the size and scale of the items you have in mind. Having the measurements at hand, you can lay the paper on the floor or carefully stick to the wall the "map" of the item in question. How does this feel in the space and is it what you thought it would be. If the answer is yes, you can proceed to the next step. This is the point that you need to consider what the overall feel the room will have, is it going to go with the other rooms in the house or as a space will it stand alone. What do you want from this space? Are you going to theme it in a style that you love, or are you going for a more practical and organised space? You can reflect you personal style either way. The relationship between fabrics and hard surfaces can also dictate decisions. Is there going to be carpet or more durable hard flooring? Will a small rug or large natural fibre mat, warm the floor in winter, only to be taken away in summer. Are you going to have curtains and blinds, maybe they are already? There and you budget does not extend to replacing them, how do you make them work in with what you want to do. Where existing blinds can be limiting, maybe a small drapery on either end will help soften the window and at the same time, bring in a colour that you want to work with. This bit of trickery is often used in display homes when whole windows of drapes are not needed and an expense the decorator cannot not afford. Prints and lamps can instantly bring a room together. A dominating image can dictate colours and stylistic elements. A large modern artwork will lead you to colours choices in other areas, and photographic print can do the same thing. Mirrors add light, dimension and are a very effective way of increasing the sense of space, face a mirror towards a lighter area to make the light reflect and brighten the room. Lamps can be a great way to add light and some intimacy at night. Depending on the furniture choices you may want either a floor lamp or a table lamp. Shade colours can be limiting, but there are ways around this and some upholsters can cover your shades to suit. Creating groups of items into a collection is a great way to make a room individual and personal. Over time you may have collected objects and images that have not only a relationship to each other but also to you. 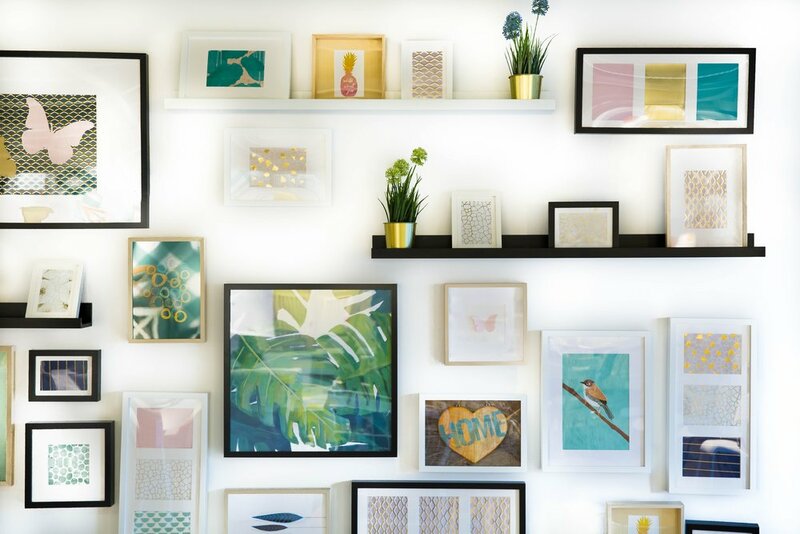 Displaying them as a group either on the wall, or on shelves can add a very individual touch. Even though they may be different sizes or shapes, putting them in the same frame style, or grouping them closely can also give the impression of a much larger image. When attempting to hang this style of decoration, lay them on the floor first and move them around to get the right combination. Measure the spaces in between and take a photo so you remember how you did it. Just remember it is your space and your style, get creative.